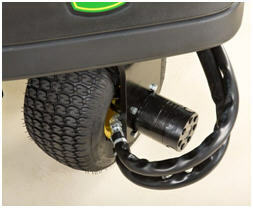 The 2653B PrecisionCut™ Trim and Surrounds Mower features a full-time 3WD hydrostatic traction system that directs hydrostatic oil flow to wheels with traction in tough terrain. This means if an operator gets into a situation where one wheel begins to slip, the hydrostatic system supplies fluid to the other two wheels to provide traction power. This system provides plenty of hill-climbing power without the need for any weight-transfer system. What's even more impressive is this system requires no extra valves for operation. This reduces hydraulic leak point opportunities while still providing ample climbing power. By being a full-time 3WD system, the unit is always in three-wheel drive, even in transport. The system is powered by the same hydrostatic pump used on the 2500B PrecisionCut Riding Greens Mower for optimum hill-climbing performance. A low center of gravity and a wide, 55-in. (140-cm) wheelbase ensure comfortable and safe operation, even in adverse mowing conditions. Wide 20x10-10 front and 20x10-8 rear turf tires provide excellent traction and stability for superior mowing performance. 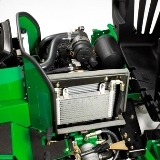 The 2653B PrecisionCut™ Trim and Surrounds Mower uses a 19.6 hp* (14.6 kW) gross (per SAEJ 1995 at 3000 rpm) liquid-cooled diesel engine for smooth, efficient, and quiet operation. With the 3-cylinder diesel engine and a large 7.4-U.S. gal. 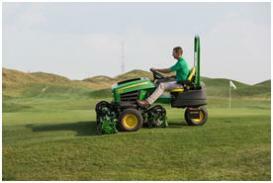 (28.0-L) fuel tank, the 2653B PrecisionCut gives the operator plenty of power and fuel for a productive day of mowing. This engine meets EPA Tier 2 and Tier 4 compliance standards. 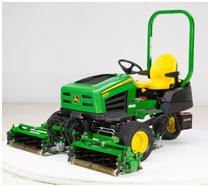 The 2653B PrecisionCut™ Trim and Surrounds Mower can improve the appearance of many areas on the golf course. It can maintain tees, approaches, fairways, green surrounds, first-cut rough, and rough. These tough demands can put a strain on lesser frames, but not that of the 2653B Mower. The 2653B PrecisionCut frame is designed with all these demands in mind and provides excellent weight distribution and the durability required for the most-demanding terrain. The frame design keeps a low center of gravity while providing excellent visibility to the front cutting units and rear of the machine. This controller gives the technician on-board diagnostics as standard equipment, meaning there are no diagnostic tools or plug-ins to purchase separately. No tools are required to access the white box controller. Simply disengage the latch to open up the access panel. This allows the technician to troubleshoot electrical problems while sitting in the operator seat. The controller has a heartbeat feature to aid the technician in diagnostics. When the LED light in the center of the controller is flashing at a regular rate, it indicates the controller is properly powered up and there are no circuit problems. Each switch or solenoid on the machine has its own LED light on the controller. Input and output functions can be diagnosed by observing the appropriate lights. When the heartbeat LED light is flashing at an irregular rate, it indicates there is a system fault of some sort. The irregular flashing rate leads the technician to the circuit to start proper diagnostics. These codes can be found on the front of the access panel to the controller. Detailed information is located in the operator's manual and technical manual. SOS diagnostics are provided to assist the operator in getting the machine started. The SOS system checks the machine system functions to be sure they are in the proper configuration for starting. The SOS system alerts the operator by flashing a light on the instrument cluster located on the dash of the 2653B PrecisionCut™ if any these conditions are not met. The battery indicator light flashes a code while the key is held in the start position. There is a label located on the white box control module access panel that advises the operator what functions are not set properly based on the code that is flashing. This label is in both English and Spanish. 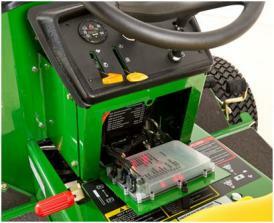 An air-restriction indicator is standard on the 2653B PrecisionCut™ Trim and Surrounds Mower. The air-restriction indicator has a sight glass with markings that show if service to the air cleaner is required. 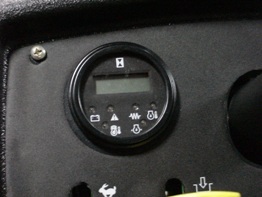 This air-restriction indicator is the same one used on the 2500B PrecisionCut Diesel Riding Greens Mower. When the sight glass in the air-restriction indicator shows red, a major airflow restriction in the system needs to be addressed immediately.